Since it’s premier in 1975, Saturday Night Live has taken a spoof of politics, especially political debates. This allows viewers to take a more critical view on politics through satire that they may not have seen when they originally watched the debates. It also allows viewers to receive access to political happenings regardless of viewers being politically active. However, this can have a negative impact on the integrity of the presidency and political office. SNL has the interesting ability to blend entertainment into political influence. It was the start of a television satire take on politics and candidates. Much like the news, SNL has the ability to spotlight political issues, especially on the Weekend Update Segment, making viewers perceive them as more relevant or important. The “SNL Effect,” or the term given for the effect of political satire influencing people’s perceptions and opinions, will likely continue to increase as more people are exposed to the show’s content online and during the live airing. The use of television media started as commercials or appearances controlled by the presidential candidate. In 1968 when Nixon appeared on the popular variety show “Laugh-In”, which was like a Saturday Night Live of its time, it took several takes for Nixon to seem comfortable and appealing to the audience. All of which was with his approval and under his direction. 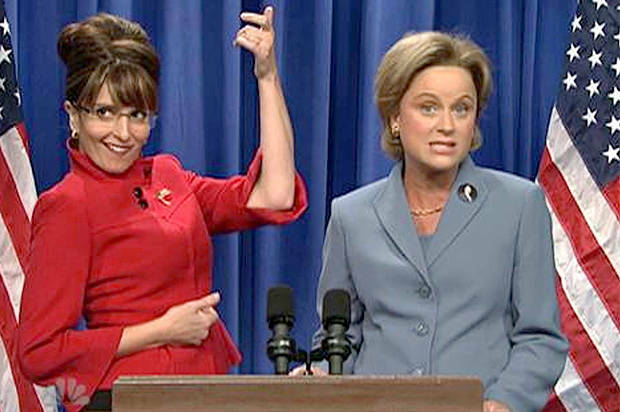 SNL uses humor mock the candidates, while at the same time holding a major agenda setting power. The show has had such a major impact on political knowledge and campaign influence that candidates reach out to be on the show to defend their character or show their true personality. For example after Tina Fey's impersonations of 2008 vice presidential candidate Sarah Palin became extremely popular and took a toll on her popularity ratings in the elections, Palin appeared on the show to possibly gain some respect. A recent example, Hillary Clinton has appeared during sketches to show her more relaxed and fun side, which she has had difficulty conveying to the public throughout her campaigns. Click image to watch the Sarah Palin Hillary Clinton impression. Hillary Clinton is not the only politician to use the show to her advantage. After Darrell Hammond’s impersonation of Al Gore in 2000, Al Gore’s campaign manager went through the tapes to help change Al Gore’s impression he was giving the American people into something more approachable. This is not a recent phenomena either. Chevy Chase’s clumsy and ditzy impersonation of President Ford, who was a very athletic and graceful person, influenced the public to see him only in this manner regardless of it being accurate. The idea is relatable to the 1960 Kennedy-Nixon debates, which due to being televised to such a broad audience as well as being played on the radio had a huge impact on the candidates' appearance and demeanor while being filmed. Nixon of course suffering in the first debate due to his sickly appearance and perceived shifty behavior. In more recent terms, Donald Trump’s SNL appearance on November 7, 2015 brought the FCC to question the equal time act on designated promotional time for candidates. Since NBC is a news station, four republican candidates said that they should be granted equal time because Trump was able to promote himself as host of the show. This begins to question the idea of what exactly is news. Click image to watch Donald Trump's SNL opening monologue explaining why he hosted the show. However, the idea that a comedic television show can have such prominent control over campaigning, politicians and current issues do not come without some down sides. The constant mocking of influential politicians shows a growing lack of respect to high positions such as the presidency or the house. Constantly portraying politicians as either clueless or power hungry gives the people a false righteousness to think that they could do a better job than the people currently in office. How can we remain conscious citizens who can hold the people in political office to their word without demeaning them personally and questioning their every move? 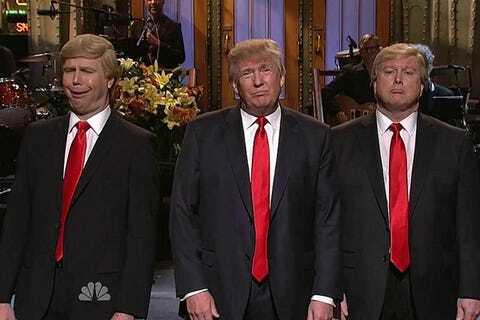 The question on whether SNL is a serious part in campaigns is still in question. Eleanor Roosevelt, a grand figure in the Democrat party at the time, did criticized Kennedy for using funds to promote himself on television and paper advertising saying that it was unpresidential. So it seems that maybe most innovations are deemed degrading until they are more intertwined consistently into the campaign. Saturday Night Live may be a new strategy that campaigns are using to take advantage of publicity or to gain knowledge on current opinions, but the major impact it has already influenced is something all potential candidates should be aware of. Can Republicans Field a Formidable Candidate?